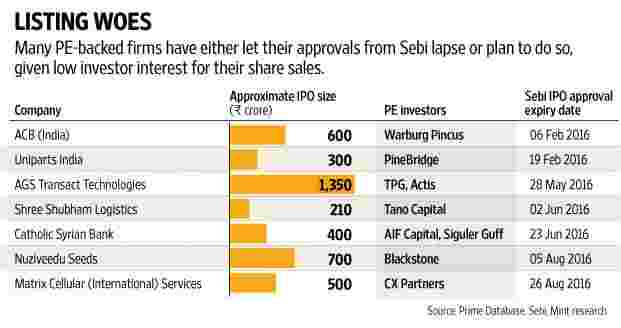 Mumbai: While several private equity-backed companies have sold shares to the public this year, several others that were expected to have deferred or abandoned their plans, denying exits to their private equity, or PE, investors. Warburg Pincus-backed ACB (India) Ltd; TPG and Actis-backed AGS Transact Technologies Ltd; Tano Capital-backed logistics firm Shree Shubham Logistics Ltd; Catholic Syrian Bank Ltd; Blackstone-backed Nuziveedu Seeds Ltd; and CX Partners-backed Matrix Cellular (International) Services Ltd have failed to access the primary market for share sale even after obtaining clearances from stock market regulator Securities and Exchange Board of India (Sebi) as far back as six months in some cases. This contrasts with the decent run some PE firms have had this year in terms of partial or complete exits through initial public offerings (IPOs) of portfolio companies. There have been about 10 IPOs this calendar year, which collectively raised ₹ 6,743 crore, according to data from primary market tracker Prime Database. Several among these IPOs, such as those of CX Partners-backed Thyrocare Technologies Ltd, ICICI Venture and Gaja Capital-backed TeamLease Services Ltd and Sequoia Capital-backed Ujjivan Financial Services Ltd, witnessed frenzied subscription. The IPOs of Thyrocare, TeamLease and Ujjivan were subscribed 73, 66 and 40 times, respectively. But others haven’t been as lucky. According to Mint research, around seven PE-backed firms have failed to hit the public markets in the last year. These companies have either let their approvals from Sebi lapse or plan to do so, given low investor interest for their share sales. Sebi’s approval for an IPO is valid for 12 months. Collectively, these firms had planned share sales worth ₹ 4,000 crore to fund future growth or provide an exit to their PE investors. According to market experts, several factors such as sector-specific issues, high valuation expectations of promoters and PE investors, and poorer-than-expected financial performance have led to this. “Several of these companies are those where there is a PE investor and the valuations that they are seeking are not acceptable to the market. PE investors would obviously not like to sell for a loss when they have been invested for five or seven years; they would like to sell at a reasonable profit," said Prithvi Haldea, chairman of Prime Database group. They’d much rather defer the IPO than book a loss, he added. In November, Mint reported that Matrix Cellular was facing pressure from its investors on the valuation it was seeking for its public market outing. The company’s financial performance was below the commitments made to investors. “We believe that with the introduction of refund of VAT (value-added tax), the company is geared to perform much better and since we had enough internal accruals, we decided to hold the IPO process currently," a Matrix spokesperson said in an e-mailed response. The desire of PE investors to optimize the valuation clashes with that of savvy public market investors looking for an upside when a stock lists. “If you are going to price an IPO at nearly full valuation and leave barely nothing on the table for the investors, then clearly that’s a no-no," said Sonal Shah, executive director at SMC Capitals Ltd. According to a 17 May Mint analysis, the median return of investors who sold IPO shares on listing in 2016 is down to 5.26% from a median return of 79.55% in 1999, indicating aggressive IPO pricing. Finally, investors have low or no appetite for certain sectors, especially those that are capital-intensive. “Some companies that have not managed to launch their IPOs are from sectors that are right now not in demand from investors. Sectors such as infrastructure and power are not the themes that investors are keen on, so the investor response for such companies will be lukewarm," said Haldea of Prime Database. In November, Mint reported that Warburg Pincus-backed coal washing firm ACB (India) was unlikely to go ahead with its third attempt to sell shares in the last five years, given the lack of investor interest in the infrastructure and power sector. According to Munish Aggarwal, director at investment bank Equirus Capital Pvt. Ltd, most IPOs that have worked well in recent times are of companies from relatively newer sectors which are under-represented in listed markets, have low regulatory risk and are not completely dependant on broader industrial growth. “Investor appetite is strong but only for fundamentally good companies where the underlying story is good," he said. In 2015, 21 companies managed to raise ₹ 13,614 crore from the primary market, data from Prime Database shows. The resurgence in IPO market came after a lull of two years, which saw just eight companies raise close to ₹ 2,485 crore in 2013 and 2014. PE investors were banking on the buoyancy in the primary market to help them exit some of their mature investments. Still, the selective nature of investors, especially when it comes to IPOs, may mean that the road to listing will not be a smooth one for many companies. “As far as IPO market is concerned the selective trend is likely to continue. Sectors which are under stress or are not seen as those where India has a competitive advantage or are not consumption-led will definitely see low interest," said Shah of SMC Capitals, adding that companies in profitable niches will have no such problem.